Children have many needs… love, understanding, a sense of belonging, and achievement. Unfortunately, there are many children who do not experience this positive cycle, and therefore cannot adjust to family, school, and/or society’s demands. AEF Summer Programs offer a special experience. Our goal is to build confidence in campers as they grow to organize their world and build positive relationships with peers. Our program and staff help campers develop respect for rules and authority figures (including family), exercise sound judgment, take responsibility for their actions, and have fun. This means we ensure a fun summer and also understand the year round system campers must adhere to. Our camp program teaches life skills which the camper can implement into their home, family and school. These children, despite their intelligence, march to the beat of a different drummer. AEF Camp Programs are designed specifically for these children and adolescents. All camp programs are Co-ed and are comprised of weekly sessions. No two children are the same. Every child is a person and every person has their own unique set of skills and deficits. Many of our campers do not have a diagnosis; they simply prefer a smaller, safer, and more structured camp environment. Some of our children have been diagnosed / misdiagnosed with ADHD, ASD, NVLD, and other social or communication deficits. Our campers have some or all of the following characteristics. The AEF Summer Program is a branch of Alternative Education Foundation, a leading not for profit organization catering towards children, adolescents, and their families who are not being successful in the traditional school (camp) environments, socially, and/or at home. The camp staff is comprised of the same multi-disciplinary team who service our full time program during the school year. All our staff are fingerprinted, pass a nationwide background check, and are CPR certified and FirstAid trained. 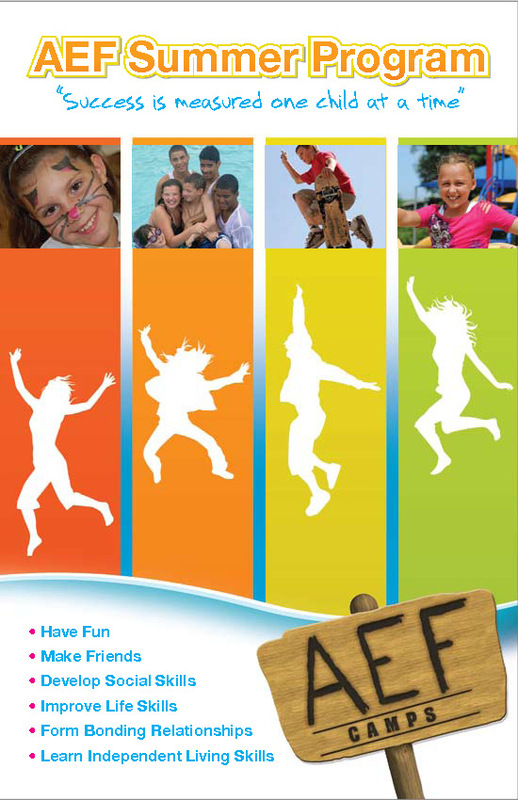 AEF Summer Camps provide children and adolescents with a safe and nurturing environment. Campers are free to discover their identities, develop self-esteem, earn self respect, learn how to lead, know when to follow, make friends and HAVE FUN. When campers return home they are more caring, understand the importance of giving, are better equipped to stand up for what they know is right, and are willing to be more responsible. These qualities ensure individual success, instill happiness, build successful nations, and promote civil and compassionate societies.